Posted on September 12, 2009 by Alicia Bay Laurel	in Blog and tagged press releases. September 20, Mori Cafe Festival in Hokuto City, Yamanashi Prefecture. September 24, Teach class at Fujino Steiner School. Make art books with 12th grade English class. Private. September 27, 4 PM Concert at Shu Cafe in Fujino. September 29, Dual interview with novelist Banana Yoshimoto. It will appear in the November issue of Switch Magazine. October 2, 6 to 8 PM Art Show Opening Party and Concert at Gallery Speak For in Daikanyama, Tokyo. Admission is free, but you need an invitation. Please email me if you’d like to be on my guest list. October 2 to 14, Art Show at Gallery Speak For. Framed original drawings from Living on the Earth, plus the artwork from the new CD Beyond Living. October 11, Concert at Teisha Garden in Komoro City, near Komoro Station, Nagano Prefecture. October 13, Interview with Murmur Magazine in Haragyuku, Tokyo, including a fashion modeling session in Yoyogi Park. October 16, 6:30 to 9 PM, Concert and talk session with special guest, actress and environmental activist Ikue Masudo (aka Saya Takagi) at FU-RYU in Minami-Bousou City. 1800 yen (free for kids under 12). For more information call 090 7202 9590 (Ishii) or 0470 38 3606 (on October 16 only). October 19, Concert at Naked Loft, at the Loft Project, Shinjuku. 7:30 to 8 PM, Bobin (Nepalese Reggae singer/guitarist). 8:10 PM to 9 PM, live talk show, with Bobin and Alicia, hosted by Kikuchi. 8:10 to 9 PM, Alicia plays. Closest train station is Shin-Okubo. October 23 or 24, Concert at Happy Flower Beach Party festival, Nago, Okinawa. Joe Dolce and Lin Van Hek from Australia will join me. 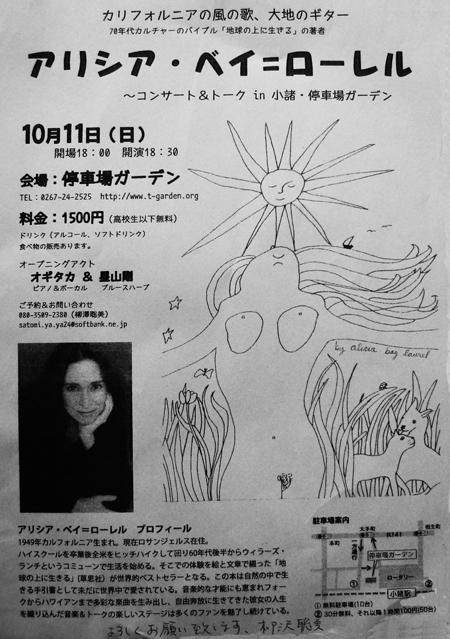 October 27, Concert at Café Unizon in Okinawa. Alicia Bay Laurel, Amana band, and Joe Dolce and Lin Van Hek from Australia. 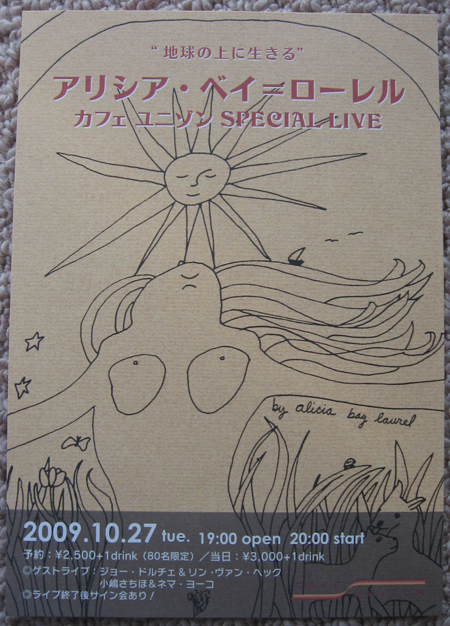 October 30 Concert at Yukotopia live house in Umejima, Tokyo. Joe Dolce and Lin Van Hek will join me. 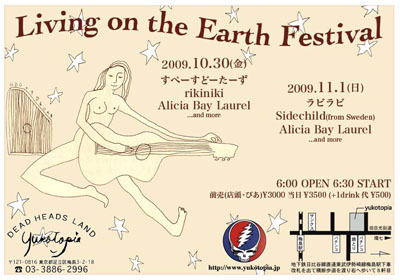 See the full sized Yukotopia poster here. Please check back; other events are still being planned! 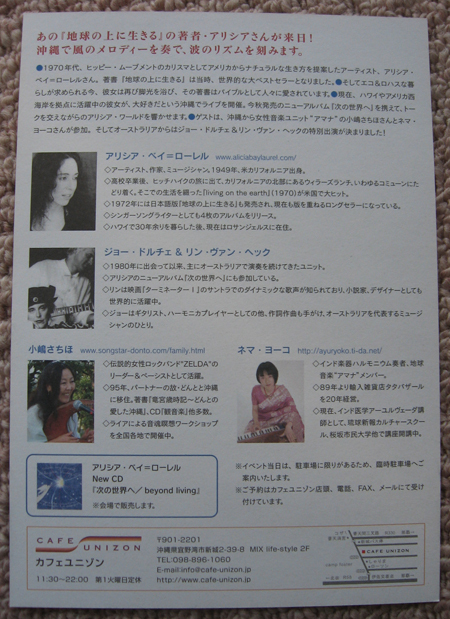 Here’s my schedule in Japanese; many thanks to Reiko Ashidate for translating it!